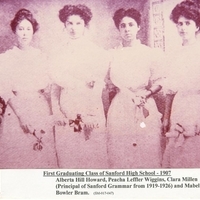 The first four graduates of Sanford High School at their graduation ceremony in 1907. The graduates are pictured wearing white graduation dresses while holding their diplomas. Photographed from left to right is: Alberta Hill Howard, Peacha Leffler Wiggins, Clara Millen, and Mabel Bowler Bram. Millen served as the principal of Sanford Grammar School from 1919 to 1926. Original 8 x 10 inch black and white photograph, 1907: box 3C, folder 1A, item SM-017-047, Seminole County Public School Collection, UCF Public History Center, Sanford, Florida. Original 8 x 10 inch black and white photograph, 1907: box 3C, folder 1A, item SM-017-041, Seminole County Public School Collection, UCF Public History Center, Sanford, Florida. Digital reproduction of original 8 x 10 inch black and white photograph, 1907. Box 3C, folder 1A, Seminole County Public School Collection, UCF Public History Center, Sanford, Florida. 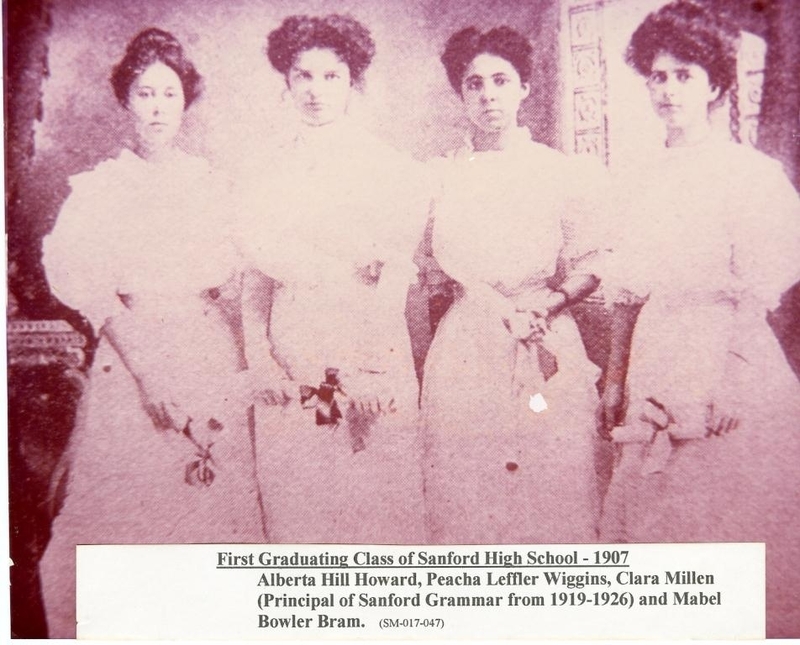 “Sanford High School Graduating Class of 1907.” RICHES of Central Florida accessed April 21, 2019, https://richesmi.cah.ucf.edu/omeka/items/show/2834.